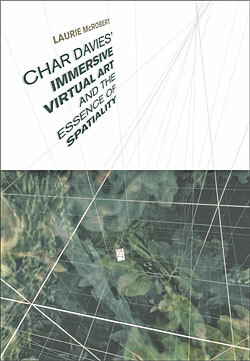 I accidentally stumbled over the book Char Davies’ Immersive Virtual Art and the Essence of Spatiality (2007) by Laurie McRobert, and that turned out to be a lucky moment, as it actually contains many interesting ideas towards pathways i have been thinking about lately. Char Davies is a Canadian artist who moved from painting to virtual reality in the late 1980ies. She creates immersive worlds that use visual and aural stimuli to create transcendental experiences and tries to evoke entirely new experiences of spatiality. Even though sometimes attributed to the technoromanticist movement, she states that the technology is just a tool on her pathway to seeking some kind of understanding. 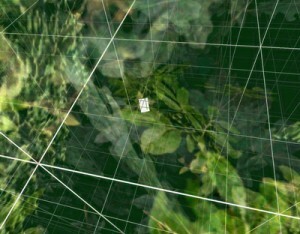 Davies completed a Ph.D. through the Planetary Collegium, her thesis titled Landscapes of Ephemeral Embrace: A Painter’s Exploration of Immersive Virtual Space as a Medium for Transforming Perception. McRobert claims that Davies’ art brings us face to face with an experience of space-time that we intuitively know but had no way of consciously accessing until now. Her art is the medium that moves us to a state of consciousness that is closer to our emotions and fears and biological founded intuition. In order to create a heightened sense in the participant, she persuades him to be still. In contrast to most interactive works, she embraces stillness and rewards the users with high resolution visuals when not moving. She also uses sensors that integrate the participants breathing as a mode of interaction. This connects the participants closer to their bodies, and their bodily experience in the virtual space. It tries to make us consciously experience the unconscious, by immersing us in an instinctive nucleus of emotion that has to do with knowing through bodily being, rather than knowing noetically, abstractly. Her art is mental exercise and physical experience at the same time. McRobert writes that there is a need today to access higher conscious states of mind, that differs from the normal state associated with everyday living. It has been proven that individuals derive most creative scientific formulas and ideas for works of art during dreams or drug ingestion. Including immersive virtual environments as a category for possible doors of perception, can give new ways of accessing this higher order of consciousness. Looking at flickering lights has the power to alter your state of consciousness. It is the unpredictability in motion that hypnotizes us. It can happen while looking at the fire, or single flames, the flickering of sunlight through leaves or on the water, or the flickering of the dotted lines on the road while driving – repetitive light patterns have a hypnotic quality that can cause our brainwaves to go into alpha or theta rhythms. These frequencies are typical for meditative or dream-like states. This altered state of consciousness is soothing and calming. Posted in meta, Research and tagged 2010, altered state, Char Davies, consciousness, Immersive Environment, Laurie McRobert, space, Virtual Reality.